There’s a famous incident involving J.P. Morgan that I’ve always loved. On occasion, he was asked what he thought the stock market would do on a given day. His answer? It will fluctuate. Yes, it’s a charming quip. But it also speaks volumes about the reality of the market. There’s simply no avoiding it: Stock prices will fluctuate. And if you’re not prepared to handle that fluctuation, you have no business investing. But price volatility is far from something to fear. The ebbs and flows of the market are precisely what create opportunity. After all, you can’t buy low and sell high without lows and highs. That’s why today’s technical indicator is an important one. It will help shed light on how to identify relative highs and lows in the price - and hopefully make your trading more profitable. Bollinger Bands, developed by John Bollinger, are lines (or bands) drawn above and below a stock’s moving average. These bands provide analysts with a high-probability range for future price action. Let’s start with a basic price chart for AT&T (NYSE: T). As you can see, J.P. Morgan was right. Stock prices do fluctuate. But do you notice anything about the price action? It seems as though there’s an unseen, yet powerful force keeping it within invisible walls. Believe me. It’s not a conspiracy. Bollinger Bands put the market’s hidden boundaries in plain sight. See those blue lines hovering around the price? Those are the Bollinger Bands. And the dotted central line is a simple 20-day moving average. The amount of space between each band and the moving average is based on what’s called standard deviation. Standard deviation is a statistical measure of variation within a set of numbers. 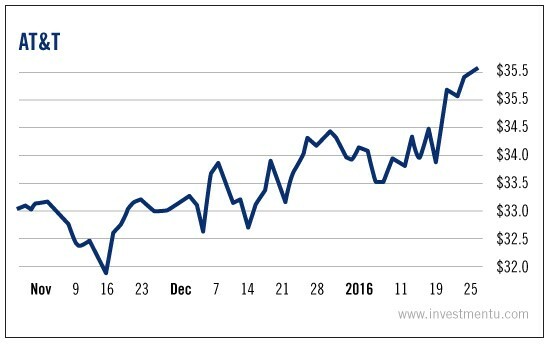 In our case, the set of numbers being measured are all of the closing prices for the last 20 days. The larger the standard deviation, the more spread out prices are from their average. The smaller the standard deviation, the closer prices are to the average. 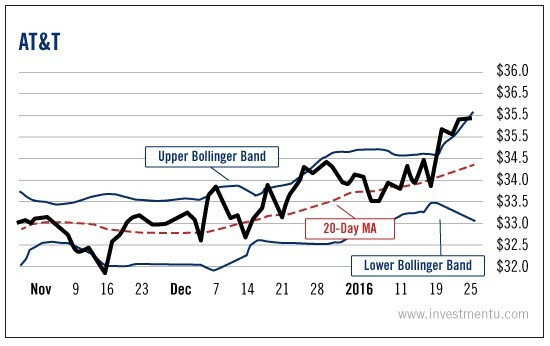 By default, Bollinger Bands are drawn at two standard deviations from the average. That means roughly 95% of the prices over the last 20 days - or any other time frame you choose - fall between the bands. This is great because you’ll know that any price near or above the upper band is relatively expensive, and anything near or below the lower band is relatively cheaper. And the best part? This range changes automatically as new price data comes in. The upper and lower bands can also be considered resistance and support, respectively. In strong trending markets, the price action will tend to cluster between one band and the moving average. For example, check out the weekly chart below for Macy’s (NYSE: M). For a couple of years, this stock saw a very strong uptrend. Most of the price action remained within the upper band and moving average lines. 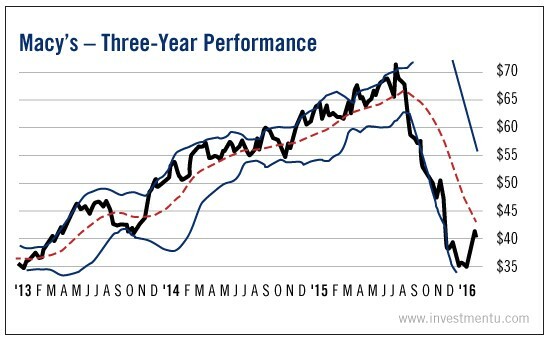 As it significantly breached below the lower band in the summer of 2015, the stock dropped like a hot potato. In a normal trending market, the stock price will often bounce from one band to the other. In these markets, Bollinger Bands can function as price levels to expect a potential reversal of a short-term trend. 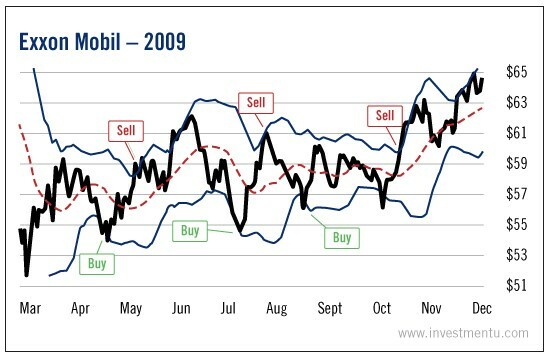 Now, let’s look at the chart below for Exxon Mobil (NYSE: XOM). 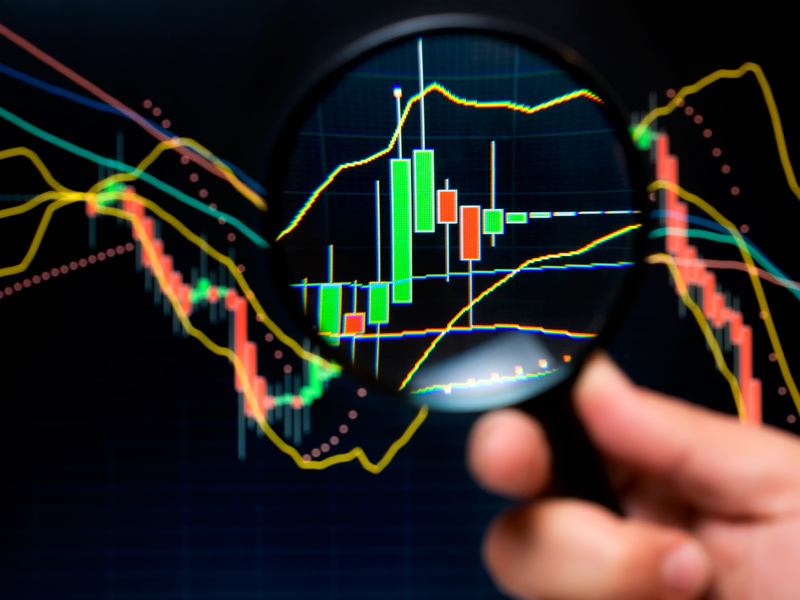 Bollinger Bands can help us determine price targets in a trend. If the price bounces off the lower band and reaches above the moving average, the upper band could be used as our price target. If the price bounces off the upper band and drops below the moving average, the lower band is our price target. Of course, it’s not a hard-and-fast rule. You should think of it as a warning to pay closer attention. In a sideways market like the one above, Bollinger Bands really shine. You can clearly see how the price bounces from band to band over time. Using the lower band as a potential buy signal and the upper band as a sell signal, you could have profitably traded the swings. But Bollinger Bands were not created as a buy/sell signal necessarily. In the end, they’re a simple yet dynamic gauge of price volatility. If you want to get the most out of this tool, use it in conjunction with another technical indicator. Now that you’re acquainted with Bollinger Bands, try applying them on your next stock purchase, and check if you’re paying a good price.